It’s always a good time to discover new face painting ideas, what with Halloween around the corner and a birthday party every other weekend. As a part-time party planner and a full-time mom I get to see the very best, and worst, of face painting skills, or rather the lack thereof, and the damage unsafe paints can do to your little one’s skin. Let’s face it, face painting has come a long way since the 70s and 80s. Back then anyone with a waxy crayon in hand and the ability to scribble a heart or a rainbow was considered a face painter. Nowadays, not so much. Kids (and parents) want realistic tigers and superheroes, glittery tiaras and ethereal butterflies that look like they’re going to take flight any second. So, with that in mind, I’ve put together a list of the best face painting ideas around at the moment, including kits for beginners and professionals, kid- and eco-friendly sets, step-by-step guides and everything in between. Available in paperback and kindle editions Fun Face Painting Ideas for Kids is almost a back to basics from the world renowned authors of ‘Extreme Face Painting’. If you’re new to face painting then this book will guide you through the basics like painting a flower to a full Frankenstein face. If you’re already pretty good but need to learn a few new techniques, like creating the look of fur, the illusion of depth, and more intricate designs. With over 1.5 million sets sold, it’s easy to see why this made it on my list. The kit includes six paints in bright colors, a brush, sponge, and ‘cheat’ tear-out design cards. There’s also a 58-page book with step by step instructions and great tips to paint faces, arm tattoos, and bracelets. In no time at all, you’ll be the Van Gogh of the party! There’s usually a kid or two at a party that as to miss out on the fun because they’re allergic to the face paint used. Not with this ultimate party pack. Snazaroo’s face paints have been reviewed by an independent professor of dermatology and professional toxicologists. They’re fragrance-free and are suitable for the most delicate skins. The colors in the pack are vibrant and dry quickly, which means many happy (and scary) faces. Being water-based, the paint washes off easily too. More and more parents are becoming aware of the toxic ingredients used in cosmetics, including face paint. Bayleaf Botanicals’ vegan paint kit is non-toxic and hypo-allergenic and is perfect for skins that are extremely sensitive, including toddlers. 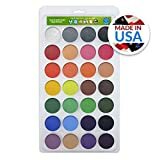 The palette has 28 colors, including light gray, dark gray, pastel pink, bubblegum, pastel blue, ultramarine, lime and forest green and burnt orange. 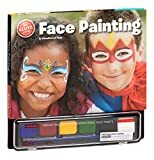 Not only does this face paint kit have a huge array of colors, it can also paint up to approximately 280 faces. With more than 25 years of being in the business, Melissa & Doug toys are made to nurture creativity and spark kids’ imagination and their face paint kit does that exactly that. The step-by-step instruction book has over 70 designs, including full-face disguises, kid-friendly symbols and fun little accents. The water-based face paint applies easily and dries quickly and the little mix tray means more fun with less mess. No face painting kit would be complete without a good set of brushes. 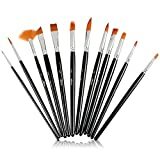 The Artacts kit includes 12 brushes, perfect for every kind of artist and any occasion. The bristles are a special blend of high-quality non-toxic synthetic fibers, which hold more paint and are super soft on the skin and because they’re not made from animal hair, they don’t cause any irritations. From oil brushes for artists to fine pointed face painting brushes, as well as square-tip and fan-shaped brushes you won’t need another set for a long time and should there be any reason you’re unhappy with your purchase, Artacts offer a lifetime guarantee. Ready, steady, paint! Snazaroo‘s mini face painting kit has everything you need to get started. Perfect for amateurs and professionals, the durable carry case comes with six 18ml face paints in white, black, bright red, bright yellow, sky blue, grass green, as well as three fun face painting brushes (round, fine and flat), two sponges, a 12ml Silver Glitter Gel, and a step-by-step guide. Bo Buggles face painting kit is made with kids in mind. The paint is vegan, lead and paraben free and doesn’t irritate the skin at all. There aren’t any instructions included in the kit but there is an E-book with eight designs. What I really like, is that even with limited artistic skills, the 30 stencils will make you look (and feel) like a pro in no time at all. Now, this is a serious kit! And you definitely won’t run out of face painting ideas with the master airbrush kit. It has pretty much everything you’ll need to airbrush faces and bodies, as well as using it for crafts, hobbies, cake decorating, sunless tanning (just be sure to use the correct color), graphics and a whole lot more. Create-A-Face prides themselves on their face painting kits. The paints are 100% FDA compliant, hypoallergenic, non-toxic, and most importantly, there’s no need to worry about allergic reactions or skin conditions flaring up. The kit includes 24 of the most popular stencils for girls and boys, as well as a complimentary E-book to inspire some great face painting ideas. Moms-to-be are always looking for new ways to announce a pregnancy or show off their bump and this belly painting kit will definitely help. The FDA approved water based paints are easy to apply and remove. The paint-your-own belly kit has an eight color professional water based makeup palette (black, white, red, pink, orange, blue, green and yellow), a sponge, a brush, painting tips as well as a design idea sheet, and a sheet of temporary belly tattoos, if you’re not confident enough to go free-hand. Feature image courtesy of Flickr, cheryl.reed.